Users with a specific administration privilege (see user access rights ) can define administration "features". A feature is an attribute that can be assigned to an administrative object itself or to a link between two administrative definitions that arent already associated. Features may be useful for developers who wants extend the OBEROn functionalities to create complex applications. They can be applied to all administrative objects; they can be created, modified, displayed, and deleted through OOQL commands or with the Contect Design client. 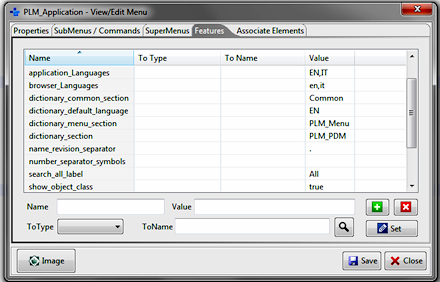 Every administrative object has the feature panel where you can manager the features associated to that object. You can connect with a feature two (different) types of administrative object, for example a form with a program, and specify a value for this connection. 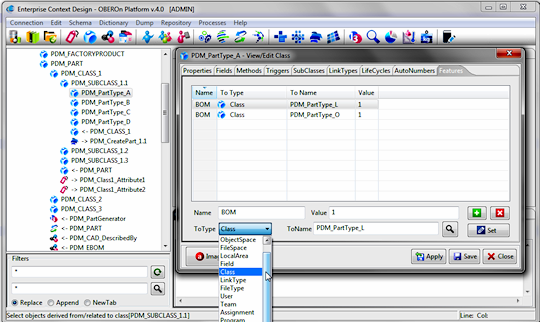 Otherwise, you can define an attribute to extend the system characteristics related to the object's type. As a feature is identified with its name, you can define only one feature with the same name between the same objects or for the same object. Changing the feature name or the "to" side object you can add an unlimited number of features for each administrative object.